Vasilievbreen is a glacier that terminates on the east coast of the southern island of Svalbard a short distance southeast of Hornsund. In 1990 this glacier had a single continuous terminus margin along the coast. The glacier retreated 50 m/year from 1936 to 1990, as the embayment of Isbukta expanded. 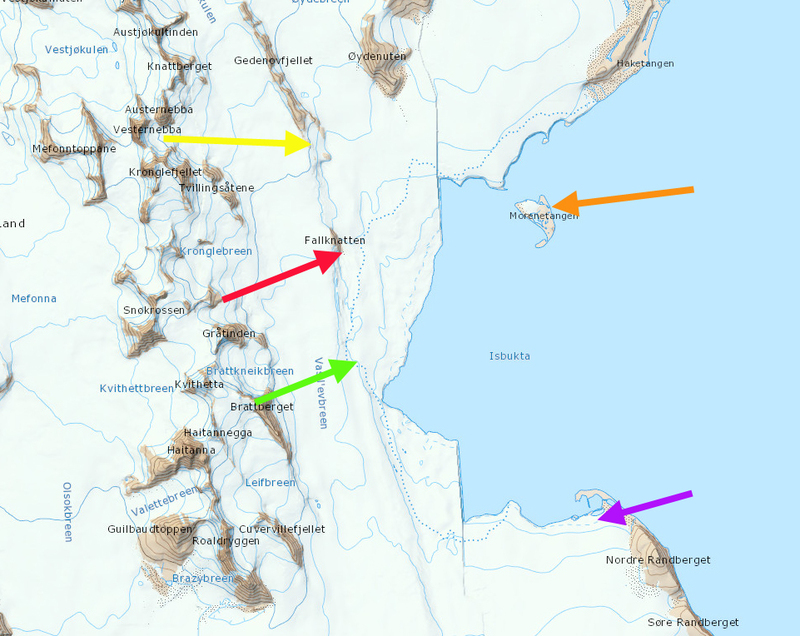 The glacier has since separated into distinct termini, on each image colored arrows indicate the same specific location, red arrow a developing island named Fallknatten, yellow arrow the tip of peninsula called Gedenovfjellet, the orange arrow an island called Morenetangen, the green arrow an emerging island not evident on the map and the purple arrow an area of new coastline on the south side of Isbukta. Blaszczyk et al (2009) analysis identified 163 Svalbard glaciers that are tidewater with the total length calving ice−cliffs at 860 km for the 2001-2006 period. They observed that 14 glaciers had retreated from the ocean to the land over the last 30–40 year period. One glacier they observed having separated was Vasilievbreen. A more detailed examination by the same researchers, Blaszczyk, Jania and Kolondra(2013) reported the total area of the glacier cover in Hornsund Fjord from 1899–2010 diminished by approximately 172 km2. The average glacier area retreat increased from a mean of 1.6 square kilometers per year to 3 square kilometers per year since 2000. The Polish Polar Station at Hornsund is an ideal location from which to conduct annual field research on the glacier and arctic environment in the area. 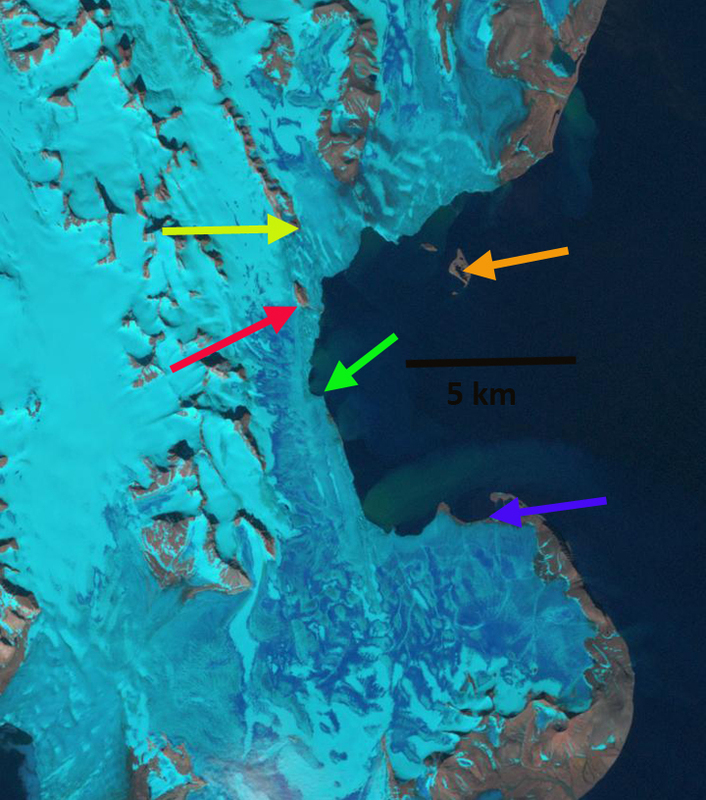 Here we use Landsat imagery to examine the changes in Vasilievebreen from 1990-2014. In 1990 the terminus is continuous. 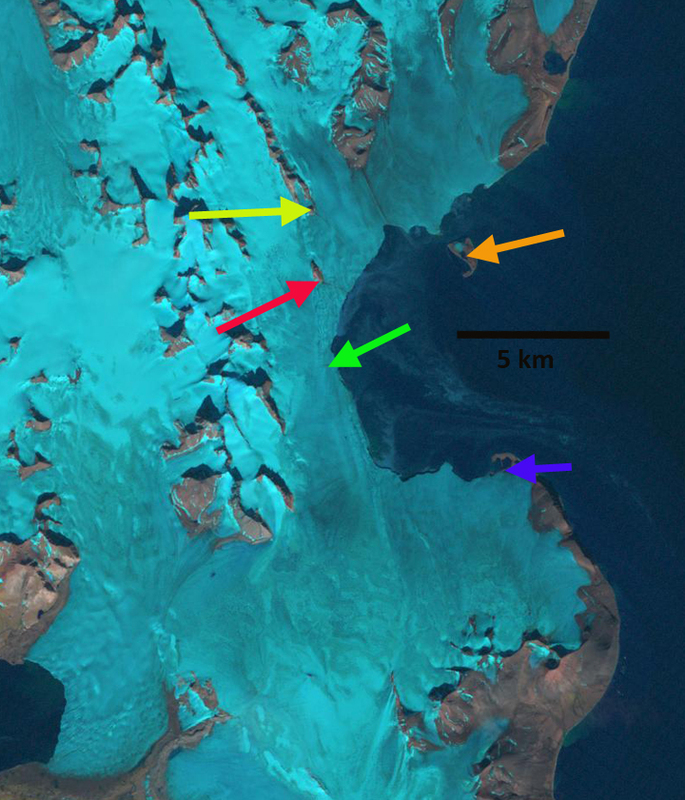 The glacier reaches the coastline at the purple arrow. There is no evident land at the green arrow. The terminus approaches quite close to the island at the orange arrow and there is a nunatak surrounded by ice at the red arrow. 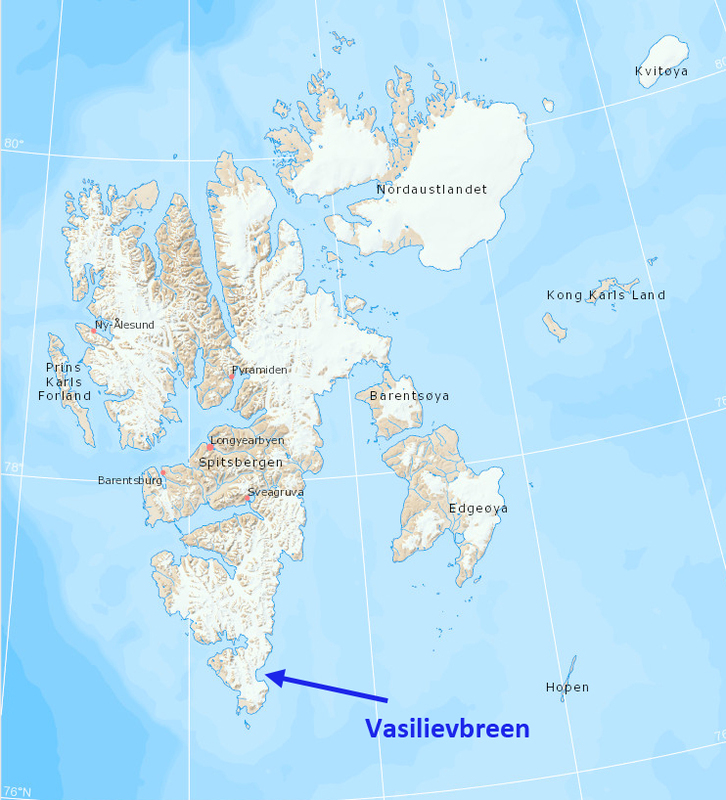 By 2002 Vasilievbreen is no longer a continuous terminus. 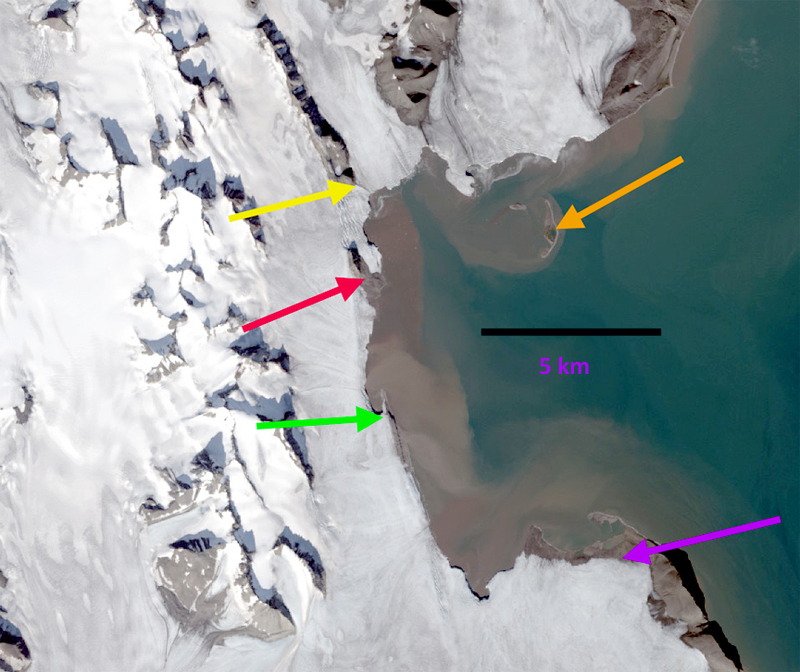 The glacier at the purple arrow has retreated from the sea, exposing a narrow strip of coastline. At the green arrow some bedrock has emerged that will become islands. At the orange arrow the glacier has retreated from the vicinity of the island. By 2014 The strip of land at the purple arrow has expanded to a length of 2km and a width of 300-500 m, this is a retreat of 400 m. At the green arrow a 3 km long rib of bedrock is exposed and the glacier has retreated 500 m since 1990. 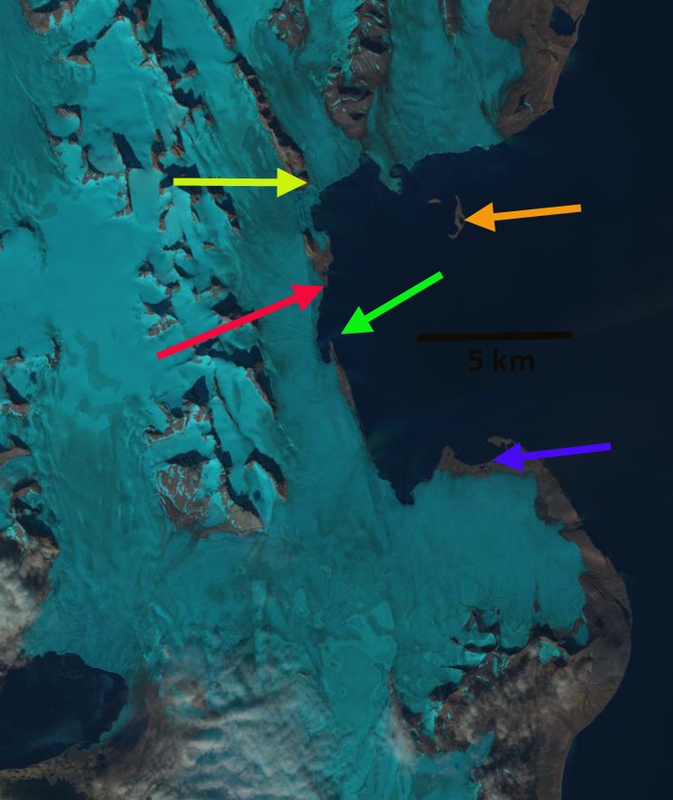 At the red arrow the nunatak of 1990 is now at the terminus of the glacier and is much larger, a retreat of 750 m. At the yellow arrow the end of a peninsula is now much closer to the ocean, a retreat of 900 m. At the orange arrow this moraine based island has been eroding, but is also much further from the glacier, a retreat of 800 m. The glacier now has five distinct terminus segments that can retreat independently of each other. That this retreat occurred along a front that is 20 km long represents a loss in glacier area of approximately 10 square kilometers. This is more significant than the actual distance of retreat. The snowline on the glacier in 2014 is above 300 m with the melt season still going, this leaves most of the glacier in the melt zone. The retreat and changing nature of this glacier paralells that of other glaciers in southern Svalbard: Nannbreen, Olsokbreen, Hornbreen and Hambergbreen. This entry was posted in Glacier Observations and tagged hornsund glacier retreat, isbukta glacier retreat, southern svalbard glacier retreat, svalbard glacier retreat, vasilievbreen glacier retreat. Bookmark the permalink. Hello Mauri, there several other glaciers showing retreat around Svalbard / Spitsbergen, have a look at Petermannbreen for instance? Yes, there are plenty to choose from. I will take a look next up will be Strongbreen though.